Making the prefect pie crust is an essential baking skill! 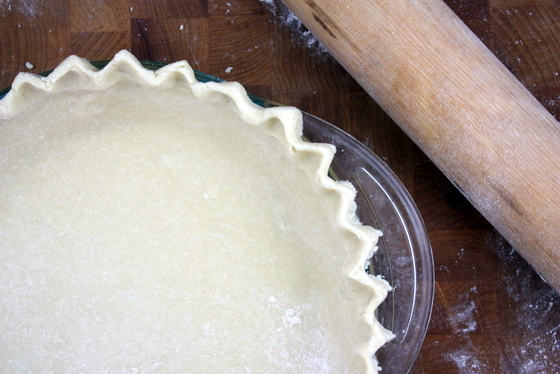 While buying a pre-made pie crust is easy, successfully making your own earns you some well deserved respect. It really isn’t that hard, and you can make it in big batches to put in the freezer and pull out whenever you need it! This crust works best if you par-bake it for 15-20 minutes before you add the filling The recipe below is for one pie crust, so if you need a top layer, double the recipe! A rich, buttery pie crust that’s par-baked to ensure crispiness. Mix flour, salt, and sugar together in a bowl. With a pastry cutter, or two forks, cut chilled butter and shortening into flour mixture until it is in lumps the size of peas. Add the ice water gradually until the dough will form together in a ball. Turn the dough out onto a smooth surface and use the heel of your hand to push small (egg-sized) bits of dough across the surface 6-inches. This process if called fraisage. When all the dough has been pushed across, gather it together, form into a disk, wrap in plastic wrap and chill in the refrigerator until you use it. The dough can be frozen, just put it in the refrigerator for a few hours before using. The less water you use, the less likely your crust will shrink in the baking process – try not to overdo it! The fraisage is essential for blending the fat and flour and resulting in a flakier crust. It’s really fun to do also!